22 Weird typos & other issues in "Authority->Roman Catholic"
26 Who are the greatest villains of the Bible? 30 Can be opened for posting? 31 Jesus Christ himself may have written the perfect Epistle to the Hebrews in the New Testament, as no other plausible author has been suggested. 33 Discussion of the propriety of calling the LXX "the Bible of the Apostles." 34 Suggested changes to opening paragraphs. In Genesis 3:1, the serpent questions what God said concerning the tree of life. "Com'on, Eve...did God really say you can't eat from that tree?" One can transliterate this verse any way they want, but the meaning remains the same: Satan did not attack God personally, but he attacked His word, questioning what He said, and trying to make Eve question it too, which she ultimately did. Look, Karajou. Let's be reasonable about this. The fact is that la is not a definite article in Greek. Not in Ancient Greek, not in Koine Greek and not in Modern Greek. If you do a Google search of "definite article" Greek, you'll get dozens of pages that all show the exact same declension. Or go and look it up in a dictionary or grammar. Biblia is neuter plural, thus the correct article is ta - ton biblion, ta biblia. Moulton, James Hope. A Grammar of New Testament Greek. Wilbert Francis Howard, ed. Vol 2. Edinburgh: T. & T. Clark, 1920. P. 117. Blass, Friedrich and A. Debrunner. Grammatik des Neutestamentlichen Griechisch. Friedrich Rehkopf, ed. 14th edition. Göttingen: Vandenhoeck & Ruprecht, 1976. §249-276. Bauer, Walter. Griechisch-Deutsches Wörterbuch zu den Scriften des Neuen Testaments und der frühchristlichen Litteratur. Kurt Aland and Barbara Aland, eds. 6th edition. Berlin: Walter de Gruyter, 1988. Heading βιβλίον, columns 281-82. Intro paragraph: Assumes every Bible adheres to the Palestinian canon; some do not. Some sects have three parts to their Bible: The OT, the Apocrypha, and the NT. Some have an OT, an NT, and an Appendix. Some have a larger OT than others. The Old Testament: Again, assumes Palestinian canon. The Tanakh is not the same thing as the Old Testament; it coincides with the OT of some sects, but it is a subset of the OT of other sets. Tyndale: Says that Tyndale's translation led "finally to the KJV." Since there have been many revisions/new translations using the KJV as a base, one might say that the Tyndale stream has not yet reached its end. Where it will finally lead, no one knows. Recent Bibles claiming a Tyndale genealogy include the NRSV and the ESV. KJV: The "Textus Receptus" was not a translation (except for a few portions of Rev backtranslated from Latin), and it is arguable whether a Textus Receptus even existed at that time. KJV: The possessive form of it should be its. KJV: Shakespeare did not use the KJV throughout most of his life, and it is doubtful that he used it very much near the end. He would've used the Geneva or Bishop's Bibles. KJV: Milton probably used the Geneva, not the KJV. KJV: Ref number 5 is a broken link. Suggest removing it until a source for the quote can be found. Regarding your first two points, I think as it stands the current article is specifically about the Christian Bible. We Jews, of course also use the term the Bible to refer to our own scriptures (needless to say, exclusive of the NT). "(1:1-2:3) The Genesis 1 account conflicts with the order of events that are known to science. ": This is really a case saying "My view is right, your's is different, so yours is wrong". That's the fallacy of begging the question. The same applies to the next two points for the same verses, so I'll skip them. "(1:3-5, 14-19) ... God creates light and separates light from darkness, and day from night, on the first day. Yet he didn't make the light producing objects (the sun and the stars) until the fourth day": So? Is this trying to claim that God cannot make light by any other means? Given that even us humans can, this is a ludicrous claim. "And how could there be "the evening and the morning" on the first day if there was no sun to mark them? ": Quite easily. To mark the days you need a rotating Earth and a source of light. The account already mentions that there was a source of light, so what's the problem? "God spends one-sixth of his entire creative effort (the second day) working on a solid firmament. This strange structure, which God calls heaven, is intended to separate the higher waters from the lower waters. ": The Bible says nothing about a "solid firmament". This is an invention, probably due to a misunderstanding of what the Hebrew for "firmament" means. It has nothing to do with "firmness". "(1:11-13) ... Plants are made on the third day before there was a sun to drive their photosynthetic processes ": So? There's two answers to this. First, there was already light, and that's what the plants need, not the sun specifically. Second, they had to survive 24 hours without the sun! Wow! How long do the Skeptics think a plant can survive without light? That's enough to give you an idea. I skipped a few, mainly because the explanations would have been a bit longer. But essentially, they've said nothing accurate in those first few. The annotations have no credibility. I might take you seriously if you cited a single fallacy among those, Philip. But, in the interest of fairness, I'll go through and criticise your answers. 1: Yes. It goes against the way things are shown to have happened. How is that fallicious? 2: For one, humans can't, our glorious creations can. For two, yes, that's exactly what it is claiming. 3: No, it says that there was light, not a source of light-- Unless of course you count Yahweh. 4: Then pray tell, what does firmament mean? 5: Not very long. You see, Philip, plants use sunlight in combination with the chloroform in their leaves or needles to create a type of sugar which they use for food. Without this, they'll die rather quickly. 1. The Bible says it happened one way. Evolutionists say it happened another way. You have two competing accounts, and you are judging the veracity of one account (the biblical one) by comparing it to the other account (the evolutionary one). That is, as I said, the fallacy of begging the question. 2. Humans can. Yes, they have to use tools or "their creations" to do so, but they can. And even if we couldn't, it doesn't follow that God couldn't. 3. If there is light, there must be a source of light, even if that is God Himself. 4. You don't know? How about doing a bit of proper research, instead of just reading Skeptic rubbish? 5. How long is "not very long"? Less than 24 hours? I did name a logical fallacy, in the first one. Most of the rest would fall under Red Herrings, or Excluded Middles. 1. One is science, supported by years upon years of research, and the other is religion, supported by a book written by bronze agers. 2. Of course, right. Deus ex machina. Arguing against the powers of your deity is futile. 3. Indeed, unless of course we are to interpret the verse as your God creating the concept of light. 4. Tsk, tsk. It is not my job to define your terms. 5. Yes, Phil. Less than 24 hours. ... How do any of them fall under excluded middles? :/ Red herring, maybe, but so much of the Bible is. (unindent)1. When two people disagree, the only way to get agreement is to argue from common ground. Arguing that the other's view is wrong because it doesn't fit with your own view is the fallacy of begging the question. I have pointed out above that the first point listed is a case of begging the question, because it is arguing that the Bible is wrong because it doesn't fit with the evolutionary view. Yet your answer, that one (evolution) is science supported by much research, and the other (creation) is based a book written by primitive people, is not an argument from common ground, but from claims of evolutionists. That is, the claims that evolution is science and is supported by much research are not facts, but evolutionary arguments! The same applies to your claim about the Bible. So your attempted rebuttal of my claim that the argument is fallacious because it begs the question also begs the question! 2. Your reply is to try and mock because you have no argument. As you have no argument, you've effectively conceded that the Skeptic argument is invalid. 3. Even if it could be interpreted that way, it doesn't rule out that it can be read another way, so the argument fails. Proposing another possible way of understanding something does not mean that the first way is wrong, yet the skeptic argument requires the first way to be wrong. 4. If you are going to make the claim (which you are implicitly doing by endorsing the Skeptic claim), then yes, it is your job to justify the claim. We are not talking about my terms, but about the correct meaning of a Hebrew word. You (implicitly) claim it to be one thing, so the onus is on you to substantiate that claim, not on me to refute it. 5. I will remind you that I gave two answers to this one. That is, two independent answers. So answering one still leaves the other to be answered before the claim is substantiated. But as for your attempt to refute one of the answers, this site indicates that "most plants [can't] live for more than a few days without at least some light" (my emphasis). 1. So let me get this straight. One cannot possibly argue that the genesis account is wrong because it has no basis in science? 2. The powers of a deity are unfalsifiable, therefore it is useless to argue against them. 3. Oh. So it is your view that god literally created light-- Everywhere, of course, not in a specific location? 4. Philly, philly. The crud I go through for you. "the vault of heaven; sky" is the definition I got for firmament. Which makes your original response entirely nonsensical. 5. Most plants also would've had stored energy beforehand. A plant that had never been exposed to sunlight would not. 1. (Your question has an ambiguity, but I think I know which way you mean it.) No, that's not what I said, but yes, your statement is correct, because you are trying to use science outside its domain, i.e. determining unobservable, untestable past events. 2. In a sense, that's true. That is, Skeptics keep complaining that the creation account is unfalsifiable, yet here we have the Skeptics trying to falsify it! But it's not totally true, because in this case there are arguments that could, in principle, be made, such as arguing that the text does not allow for the explanation I gave. However, the text doesn't disallow the explanation, and you have no grounds for excluding it. You can't defend an argument by complaining that you have no way of defending it! 3. Huh? It is biblical teaching (and therefore my view) that God created light. It is deducible from biblical teaching (and therefore my view) that the light came from a particular direction (which is not the same thins as "in a specific location"). 4. Okay, seeing as you've actually gone to the trouble of looking it up, I'll apologise for being misleading. Perhaps the idea of it being solid wasn't "invented" as such, as I think the idea of it being solid did arise inadvertently due to a misunderstanding or something like that. However, I was still correct in claiming that it doesn't mean "solid". Your definition "the vault of heaven" would most likely be a euphemism for "sky", the second part of your definition. In other words, it's still not something solid. Furthermore, anybody who's done a modicum of research on the subject should know that, and it's been pointed out before, so it doesn't excuse the Skeptics for using this at all. The best translation of the word is probably "expanse" (Genesis 1:2 . See here for a detailed study of the issue. 5. First, how do you know that God didn't create them with stored energy? That is presuming something that supports your case rather than seeing if there really is a problem. Second, it still ignores that I gave two independent answers, and you are only attempting to address one of them. Did you read Flat Earth? Your answer indicates that you didn't, but then it wouldn't be the first time you've distorted something beyond recognition. I believe it is the council of Jamnia not Jemnia. Although the old testament is written by many human authors, new testament authors claim that these men were writing under the inspiration of God. The apostle Paul states in 2 Timothy 3:16 "All Scripture is breathed out by God and profitable for teaching, for reproof, for correction, and for training in righteousness". Similarly the apostle Peter states in 2 Peter 1:20-21 "knowing this first of all, that no prophecy of Scripture comes from someone's own interpretation. For no prophecy was ever produced by the will of man, but men spoke from God as they were carried along by the Holy Spirit." 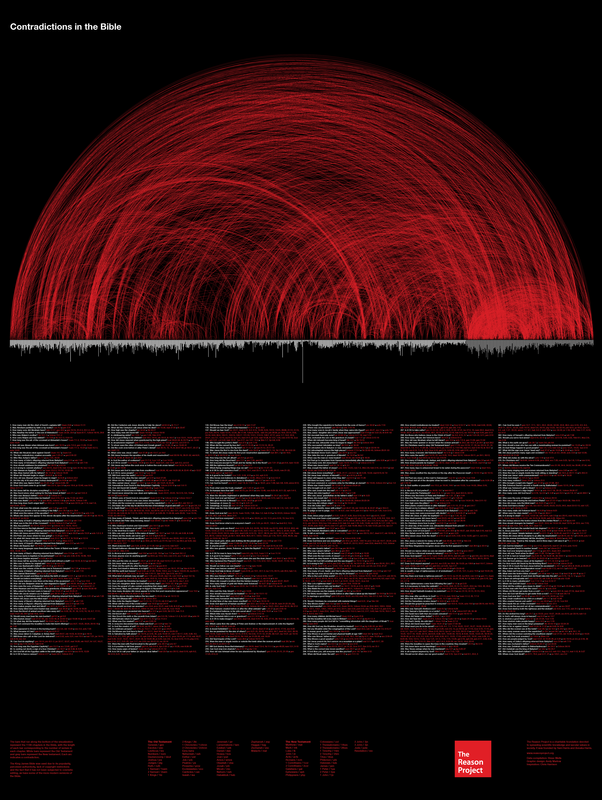 Would some one be able to provide links to the bible's sources? -Brargrar 7:49 11 February, 2009. The Bible was written before there were hyperlinked documents. Much if not all of the Bible was written by eyewitnesses, not by people using pre-existing documents. I not think that is completely true. Off the top my head, 2 Mc 2:23 clearly states that book itself is an abridgement of a lost five-volume work. The author of Jude in verses 14 and 15 cite a prophecy that is in the apocryphal Book of Enoch (The same Enoch from Gn 5:21-24). I did say "much if not all", but yes, you've proved that it's not all. However, I'll point out that referring to another book is not the same as being based on it, and I think a number of such references are merely that—pointing out that more information can be found in other books. But some will remain as being sources. Nevertheless, much of the Bible would still be eyewitness accounts. Philip J. Rayment 20:55, 12 February 2009 (EST). The numbers are a bit low, at least the NT one, it seems. This site lists complete translations being in 438 languages, and "Testaments" translations in 1,168 languages (apparently in addition to the 438). And yes, they would likely cover the vast majority of the world's population, but the claim that it has been translated into "nearly every language on Earth" is still an overstatement, as worded. TedM, I've unlocked the page; it has been locked long enough. I would say I am proud not to have any preconceptions about religion, or the lack of it. With this spirit in mind, and a large amount of different educational viewpoints, I decided to read the bible. The overall message of the new testament is a good one (not so much with the old testament), that we should be kind and respect one another. But while this message is one we should all follow, certain things need to be stated. The bible isnt logical, as I've seen many people say. It has many contradictions, things which dont make coherent sence, and stories that can have many different interpritations. Can something about this please be said in the article, in the interest of fairness for all (i.e. the message of the bible). And please dont block me, flame me, or post stupid replys, and bear in mind I have read it, and i can cite opposing statements etc. Oh, and Mr Schlafly, I wouldnt object to a logical conversion attempt, if you agree to civil terms. Would it be ok to add the following section to the main page? Liberals, atheists, and secularists frequently attack the Bible and Christians by selectively taking certain passages out of context. Such attacks are excellent examples of liberal deceit and fall apart in the face of honest, thoughtful investigation. Particular favorites of liberals include passages they claim are sexist, such as "Wives should be subordinate to their husbands as to the Lord." (Ephesians 5:22) or "I do not permit a woman to teach or to have authority over a man. She must be quiet." (1 Timothy 2:12). In reality, those passages reflect deliberate misunderstandings and mistranslations, often by liberals themselves. In the first example, for instance, the phrase "subordinate" would be more accurately translated from the Hebrew "לְהַכפִּיף" as "respectful and loving." Of course, even that might be a problem for liberal feminists. Another group of passages liberals love to quote is those in which God appears to be violent or wrathful. For example, in Genesis 7:23 God causes a great flood which wipes the earth clean of sinners and evil by drowning the corrupt men who have perverted his vision for humanity. However, while liberals who believe in moral relativism may not understand, God was ensuring the future of humanity by destroying a 'false start' who betrayed his vision by engaging in all kinds of perversion and iniquity. More importantly, since liberals do not accept that Jesus Christ came to redeem mankind for our sins, they do not understand that the perfection of the Old Testament is found in the New Testament and that the real Truth is His word. What this proves is that God is both stern and merciful; He punishes sinners for their crimes against Him, but also offers them a path to redemption through Christ. Weird typos & other issues in "Authority->Roman Catholic"
I was glancing at the article at noticed how that section contained odd misspellings ("bishop ov Rome", "Majesterium" instead of "Magisterium", "second comming", "regualtion" should be "regulation"), and there is an attempt to describe papal infallibility in an incorrect manner. Councils (such as Vatican I from which the papal infallibility dogma came) are considered infallible, but only two infallible decisions by a Pope have occurred to this date. It needs to be clarified that the infallible status of infallibility came from the First Vatican Council, not the Pope. Also, the Charismatic Movement is non-denominational. There seems to be a criticism woven into technical language on Scripture interpretation. I see a lot of other sections with also-unusual typos ("Septuaginta" instead of "Septuagint"). The Roman Catholic Church, like the Orthodox Churches, has a strong sense of the authority given to the Bishops by Christ to teach, interpret, defend the Faith and therefore to exercise the responsibility to interpret Scripture to the faithful. Since Vatican II, there has been an increased effort to bring knowledge of Scripture to the laity, resulting in an increase of Scripture reading and study programs throughout the Church. This has been abetted by the non-denominational Charismatic Movement, which has had the effect of promoting individual appropriation of the gifts and graces of the Holy Spirit, and with that, the devotional and intellectual use of Holy Scriptures. However, the role of "Magisterium", that is the teaching authority of the Church, strongly sets limits to individual interpretation. The Roman Catholic Church understands that while the Magisterium is given to all the bishops, the definitive exercise is limited to one bishop - the bishop of Rome, the Pope. Further, it is believed that the Pope, when declaring dogma (teaching) ex-Cathedra (from the chair) speaks infallibly (on matters of faith and morals). This has happened twice since the dogma was defined in the First Vatican Council (Vatican I). In addition, Catholics believe that doctrine from Councils are also infallible. Rather than hold to a literal interpretation of Scripture, Catholicism looks for "the meaning" and "the message" contained within, promoting the concept of "apostolic succession" - that the bishops are successors of the Apostles, with the successor of Peter, the Pope, as their leader. Interpretation of Scripture and Catholic Tradition by authorities result in such Catholic teachings as the prohibition of abortion." There's a section here called "Authority of Bible in religious communities". I think it is worthwhile to note somewhere on the Bible page that Islam considers many Biblical characters to be prophets: Abraham and Jesus, for example, but also people such as Adam, Noah, and Mary (mother of Jesus). This is useful information for people considering how to talk about Scripture with Muslims. Who are the greatest villains of the Bible? Of course it's nonsense, but could you please provide explanation for every so-called "contradictions" so that I could use it against them. Can be opened for posting? Can this http://bertschlossberg.blogspot.com/2012/11/jesus-through-fabric-of-our-lives.html be posted under the title "Jesus through the Fabric of our Lives" in External Links ? Thank you! Jesus Christ himself may have written the perfect Epistle to the Hebrews in the New Testament, as no other plausible author has been suggested. Andrew Schlafly, I'd prefer it if you could keep your pet ideas out of the encyclopedic articles. If you have to introduce this speculation, it shouldn't be mentioned in the leading section: please reread the opening paragraph - it just looks out of place there. It could be augmented to say, "While authorship is unknown, Andy Schlafly has put forth a theory that this particular book may have been authored by Jesus Christ himself." Have you checked out C[eslas] Spicq's writings, or do you rely on amazon commentator trini "HWS"'s assessment? After all he/she is in the top 6 million commentators, and nearly half of his/her comments are seen as helpful! What does Spicq think about the authorship of the letter? God or perhaps un philonien converti au christianisme? Was the most perfect verse of the Iliad written by Zeus? Based on Acts 1:3 we know that Jesus taught his apostles and disciples much more, just as he had promised them (John 16:12). What did he teach? Certainly he taught everything that we read in the Gospels, including the details of what he experienced and said in the Garden of Gethsemane while the apostles slept, and could not have known what he had prayed, and in the desert with the devil during the 40 days in the wilderness when they were not present as witnesses to that confrontation, and could not have known what was said. Historically many followers of heretical teachers of esoteric doctrines have attempted to promote their teachings as the secret teachings of Jesus which he supposedly revealed during the 40 days after his resurrection, for example, "These are the secret sayings that the living Jesus spoke and Didymos Judas Thomas recorded." (Gospel of Thomas). New Agers see the phrase "living Jesus" as indicating that these are the words he spoke after his resurrection while he was staying at the home of one or another of his closest followers. At the other end of the debate we have only the tradition of scholars who have repeatedly assured us that "Jesus never wrote a thing", and that he "never handed them a Bible and said, 'Here, preach this'." If Jesus did take the precaution of writing an authentic explication of his identity as the Son of God superior to the angels, of the superiority of his self-revelation to the law of Moses and of his sacrifice as superior to the ritual animal blood sacrifices of the temple, together with the necessity of remaining faithful to him as the Word of God, and calling on all Hebrew believers to be faithful to "Jesus the Son of God" and to those he had made leaders of the flock, then he would have personally written or dictated to the apostles his core doctrine during the 40 days he presented himself alive after his passion by many proofs, appearing to them, and speaking of the kingdom of God. The other documents of the New Testament were subsequently written under the guidance of the Holy Spirit after the Day of Pentecost, which happened 10 days after Jesus ascended and returned to the Father in heaven. Bryn Mawr, Harvard, A New History of French Literature (googlebooks). If the premises on which Andy Schlafly's hypothesis are valid, then the "possibility that Jesus himself wrote the perfect letter to the Hebrews" is not at all untenable. It is not impossible, and it is not unreasonable; it just can't be demonstrated to have been proved beyond the shadow of a doubt to all students of the scriptures. I trust these comments will help reduce the intensity of this controversy. It is rare in biblical studies that any speculative hypothesis has ceased to be debated because a universal consensus has been reached, and I expect this one too will be no exception. I would argue that Hebrews was probably not written by Jesus, primarily because he had no reason to write anything. He was there among the Hebrews and was followed by large crowds everywhere he went. His deeds and teachings were known throughout Judea and Samaria, and if he wanted to reveal something he merely had to say it. Discussion of the propriety of calling the LXX "the Bible of the Apostles." Suggested changes to opening paragraphs. This page was last modified on 20 April 2019, at 07:57. This page has been accessed 23,874 times.